"We're down with that." That was press secretary Jason Gibbs' would-be-hip reply when The New York Times asked him whether his boss, Governor Jim Douglas, had seen a certain little YouTube video called "802." In the viral clip, three Montpelier High School juniors who call themselves X10 put the milk-and-maple state on the hip-hop map with their tongue-in-cheek rhymes. The group was recently interviewed for an upcoming appearance on NPR's "Here and Now." It's good to know the governor is down with "802." But what about the owners of three Montpelier pizzerias the kids named — and ranked — in their rap? If it were food writing, "802" would need a vigilant editor. "We got seven different places to buy a pizza slice," the rappers chant in the video. In retrospect, X10 members confess the number should have been four. "Seven was just kind of over-grading, I guess," says Pat Leene, 17, a.k.a. P Nasty. "We didn't really quite sit there and figure it out. If you're looking for seven places to buy a pizza slice, we'll figure something out," he adds with a laugh. Village Pizza, Angeleno's and Girasole were each given a line in the video. Despite the fact that only one — Girasole — got a thumbs-up from X10 members, all three establishments have seen small increases in business. Who got left out? Group members say it's new kid on the block Positive Pie II, with its live music and counter-culture atmosphere. When they wrote their hip-hop culinary review, the choice came down to a flip of a coin between Positive Pie and Girasole — Girasole won. "They are both very fine restaurants," pronounces diplomat Colin Arisman, 17, a.k.a. C$ — pronounced C money. To prove it, he dishes up an off-the-cuff conciliatory rhyme: "Positive Pie where the chefs get high." His band members howl with approval. Sarducci's, which offers a variety of pizzas along with its other fare, didn't make it into the video, either. But for another reason: "I think that Sarducci's is more of a fine-dining restaurant and less of a parlor. They are very good, but they concentrate more on their pastas than their pizza pie," says Arisman. When it comes to the 'za, Montpelier is anything but your typical slice of small-town America. In addition to being the only state capital that doesn't have a McDonald's or a Starbucks, it's pizza-chain-free. "But don't go to Village, 'cause that dude ain't nice." With its jukebox and pool table, Village Pizza has the look and feel of a classic pizzeria. It has a long history as a hangout for teens like Arisman and Leene. So why did they dis manager Kenny Johnston, otherwise known as the "ain't-nice" dude? "He did not really agree with our decision to loiter and remain after we ate our pizza," recalls Arisman. The video, he says, was "the perfect way to fix our revenge." "I've never had a real run-in with the guy," demurs Leene. "I usually go with my parents, so he's always really nice. He does do his job well; we don't hate the guy. I've heard he's taken it pretty well. He was kind of upset, but he thinks it's funny now." Shane Brothers, 34, has owned the well-known City Center pizzeria for 12 years and is taking advantage of his restaurant's newfound notoriety by running an ad featuring a photo of the "dude who ain't nice." Brothers is also offering his $13.75 family-sized 18-inch cheese pizza for $8.02 through the end of the month. "We've had a lot of fun with that. We're getting tremendous response," he says, but hastens to dispel misconceptions: "We're fairly kid-friendly, despite the '802' video." "There are close to 50 different places where you can get lunch or dinner in this town," Brothers says. "It seems to support all of us. I'm not real concerned about going under as long as I keep doing what I do." Price: $13.75 for an 18-inch cheese pizza. Strangest request: fruit pizza with apricots and apples. "Cross off Angeleno's, 'cause their pie is overpriced." "I think we're very competitive," says Jan Fortier, 51, who has owned and operated Angeleno's Barre Street pizzeria for 25 years. "I'm only saying that because someone pointed out to me what was said by those young people who did the rap video. It says that we're overpriced, and the last time I looked we were comparable with all the other pizzerias." X10 member Luke Martin, 16, a.k.a. Run Rhymz, stands by his assessment. Sorta. "Maybe it was more for the rhyme," he admits. "But I've gone in there [to Angeleno's] with a $20 bill for pizza for myself and left without it. At Village I think you can get two slices for $3 — and when you turn the pizza upside down, grease runs off like a waterfall," Martin adds, proving there's no pizza reviewer quite as candid as a hungry teen. No grease waterfall runs from Angeleno's New York-style thin-crust pizza, which Fortier describes as a "soft-chewy texture, but it's not a light, airy type of a pizza dough. It gives you substance." Fortier says Angeleno's customers range from families to young people on dates to elderly people going out to eat. "It's not the musical group, not the hip-hop group," she says, conjuring up incongruous images of a hip-hop "scene" in Montpelier. Fortier is hesitant to say what distinguishes her restaurant from the competition: "Pizza is just a taste preference." But she envisions the Montpelier market as one that's close to saturation. "My thinking is that, very ironically, it's a pie. And if you slice it six ways you get six big pieces. If you slice it 16 ways, you get 16 smaller pieces. Economics the easy way." Price: $13.40 for an 18-inch cheese pizza. Strangest menu item: Peanut butter pizza, which originated with a customer who had one in Hawaii. The original pizza was peanut butter topped with pineapple, but Fortier says this popular item is often topped with cheese and meats. She's even made one with a Fluffernut topping and another with Rain Forest Crunch. "What about Girasole's? — Yeah, that'll suffice." "802? That was kind of a surprise, to tell you the truth. I saw it on the Internet. I thought it was really good. We've had people that popped in and said, 'Hey. Did you know you're on a rap video?' I thought people were joking around," says Girasole owner Gary Crouse, 46. Since then, he's honored X10 with a pizza that spelled out "802" in meatballs. So what is it about two-year-old Girasole that makes it "suffice"? "I'd say Girasole — for a quick, delicious fix that'll fill you up — is the way to go," says Arisman. "A lot of our friends work there. Maybe it was a little hometown pride." Crouse's culinary background might also be a factor. He's been cooking since he was 16 and has worked in Germany and Italy and in Manhattan at the Plaza Hotel and Trump Towers. Pizza has always played an important role in his life. "My dad's day to cook was Sunday. So he'd go out and buy pizza. That was his idea of cooking," Crouse reminisces. "The family would sit around with paper plates. He'd do the dishes, too." Girasole and Sarducci's are the only two local restaurants that cook pizza in a wood-fired oven. Crouse says his restaurant, located just across the river on Route 2, is "more family-oriented instead of being like a club atmosphere. We just have good food, and we try to be very consistent in what we do." That didn't stop him from taking notice, shortly after he signed papers to open Girasole, when he found out Positive Pie II was coming to town. "We were really, really busy when we first opened, and they definitely put a little bit of a dent in our business," says Crouse. "I saw some of the younger crowd leaving, but over time they've come back." Price: $11.75 for a 16-inch cheese pizza; $6.75 for the daily all-you-can-eat pizza buffet. Strangest request: pesto, anchovies, clams and apples. "Positive Pie where the chefs get high." "I really want to make it clear that I'm really a restaurant that serves pizza," says Positive Pie II owner Carlo Rovetto, 34. "We're not competing with the pizzerias here, even though we make great pizzas." The sandwich board outside the State Street restaurant suggests otherwise, though: "This way for the best slices in town," it announces, with an arrow pointing toward the door. Because of its State Street location, Positive Pie II draws a lot of foot traffic, often Montpelier High kids on their way home from school, who are lured by the aroma of the $2 New York-style slices, the mystical-looking sign and overall funky atmosphere. "We definitely sell a lot of slices. I think a couple hundred thousand a year," says Rovetto. The X10 verdict? "I would say, if you want to go for a pizza with character and dignity — The Pie," says Arisman, sounding more and more like a food critic. "There's this white garlic sauce, and it's one of the most fulfilling experiences one can have." Voracious, verbally clever high schoolers may come and go, but Montpelier's pizzerias appear to be in it for the long haul. Price: $12 for a 16-inch cheese pizza. 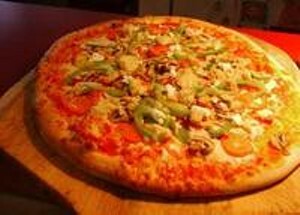 Most popular pizzas: The Green Man: pesto, spinach, organic broccoli, zucchini, tomato. Moonshadow: artichoke hearts, spinach, roasted red peppers, walnuts, feta cheese. • "Angeleno's is OK, but there's no edging. But they make the best peanut butter pizza in town," says 53-year-old Nathalie Lorimer, who says she eats pizza once a week and has a fondness for the pineapple, ham and bacon combo. Positive Pie, says Lorimer, is "so-so. I give a thumbs up to Village Pizza," she concludes. "I love the taste of the sauce and the dough. Not hard as a rock." 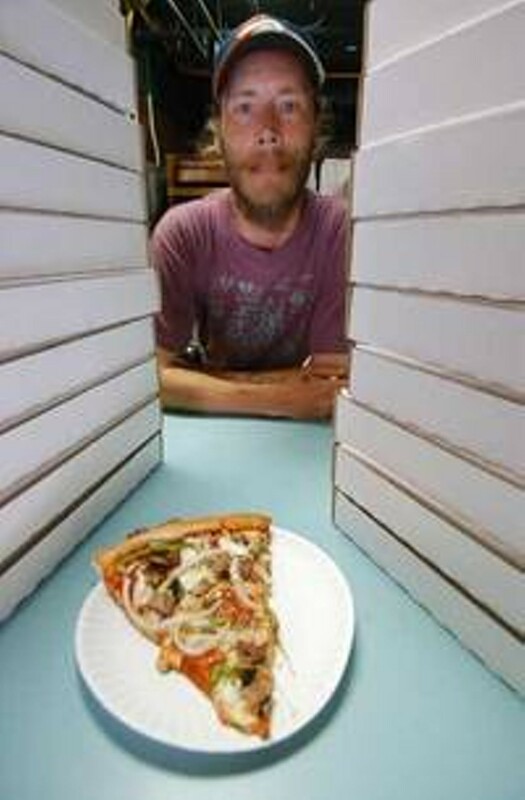 • Montpelier mail carrier Craig Montgomery, 34, says Angeleno's pizza is the best in town. "It's not greasy." • "I like food too much," says Gerry Eno, a 60-year-old security guard at Montpelier's Federal Building, patting his stomach. "Village Pizza is greasy, but chewing it is part of the fulfillment." • Suzanne Hechmer, the 32-year-old executive director of the Montpelier Downtown Community Association, keeps it diplomatically vague, saying only that she "goes for the more gourmet type of pizza." • Gary Bergeron, 48, on his way to work at NECI, pauses for a moment: "Pizza? I really don't eat it at all that much. Pizza's pizza." Village Pizza manager Kenny Johnston says he developed his not-nice reputation simply by doing his job. "The teens in this town tend to think this is the teen hang-out, and I simply let them know it's a restaurant," says the 37-year-old resident of Woodbury. "I tell them they either need to buy something or leave. Either buy or fly. I simply explain to them that this is a restaurant, and you need to act like human beings. And they think I'm mean because of that." Johnston, who claims to have no first-hand knowledge of the authors of "802," also says he's not as mean as he appears. "Not even close. If you talk to the lunch crowd that comes in, the people that work in the office, they think I'm great," he says, adding that "They actually thought it was [owner] Shane [Brothers] they were talking about."